All images from Polyvore, the coolest site ever. One of my dear friends asked how I would accessorize the French Chic wardrobe. While this is far from definitive, I think it’s an interesting start. I learn more and more every day as I build these vignettes for our shared pleasure: you should be ABSOLUTELY FANATICALLY DEMANDING when you purchase anything. There is a world of merchandise out there, and the perfect item exists, if you have the patience and the focus to find it. Settle for NOTHING LESS THAN PERFECTION. You deserve it. And if you fully intend to own many of your accessories for the rest of your life, you can easily justify buying the very best item being made today – support geniuses and craftspersons, and beautify the world. Gray short laced boot – N.D.C. You have certainly shown us that we don't actually need hoards of stuff, the accessories you have chosen are just perfect for every occasion. 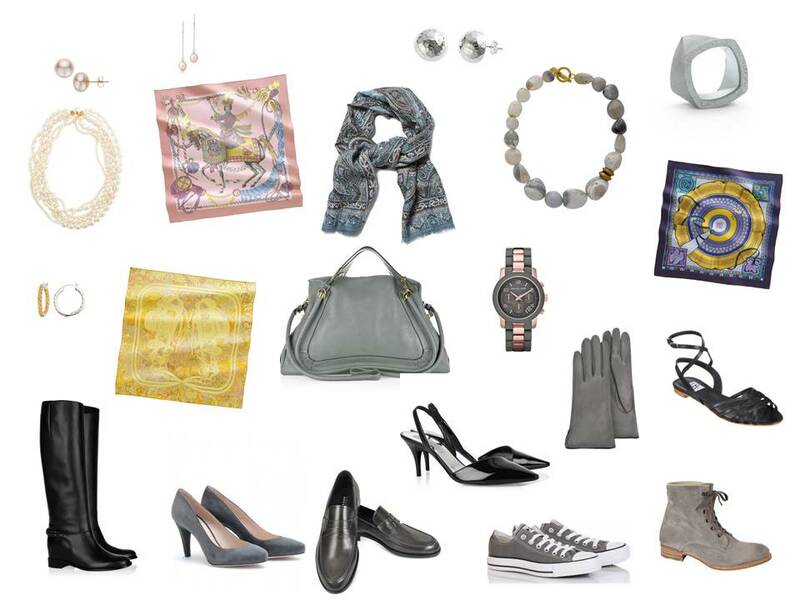 The grey handbag is georgeous with its classic line, shape and proportions and no frou frou. "Patience and Focus" will be my new mantra, along with selecting the very best for my budget. I would have never thought of gray Chuck Taylor's, and now I love it. I was planning on purchasing a navy pair (to go with jeans), but now gray looks so sophisticated. This is a great polyvore! Let us know your account name so we can "like" your creations. Love it all but you need some belts. Show me the belts :), I would like to see what you would choose.